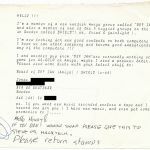 Introducing the Honey/1001 Collection | got papers? 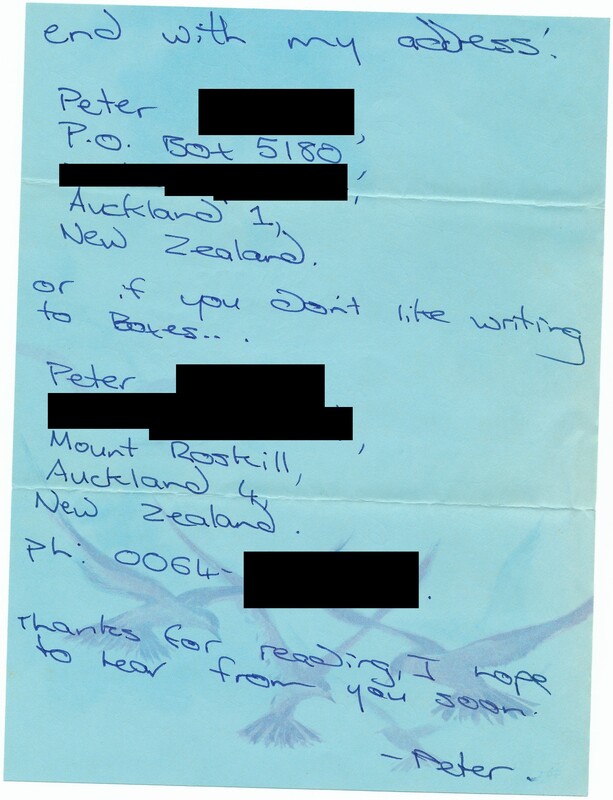 The launch of The Movers’ letter collection turned out to be a sort of honey pot for old sceners. 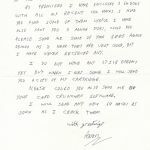 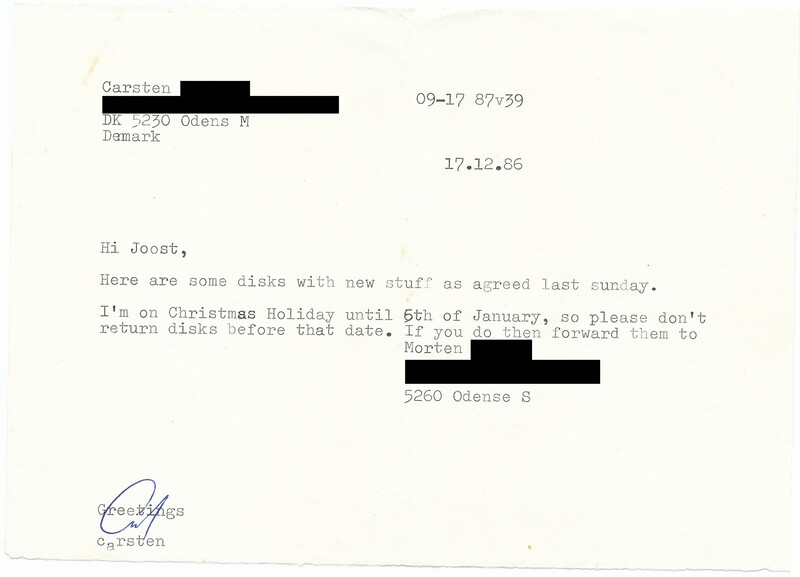 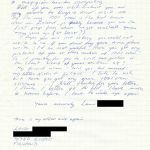 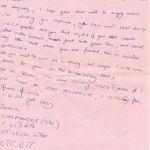 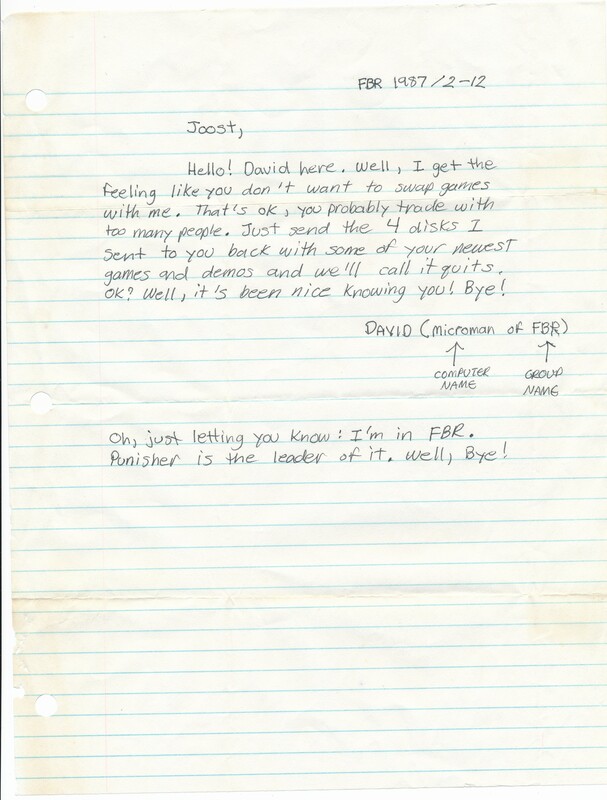 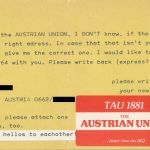 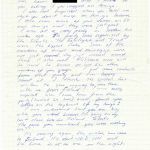 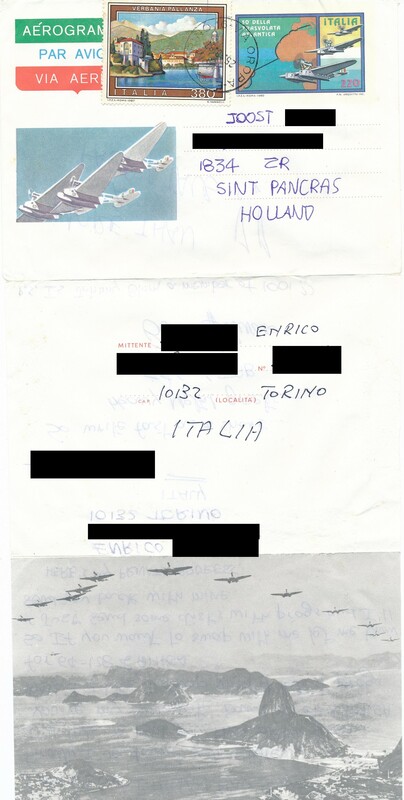 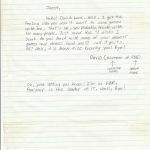 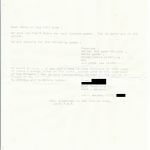 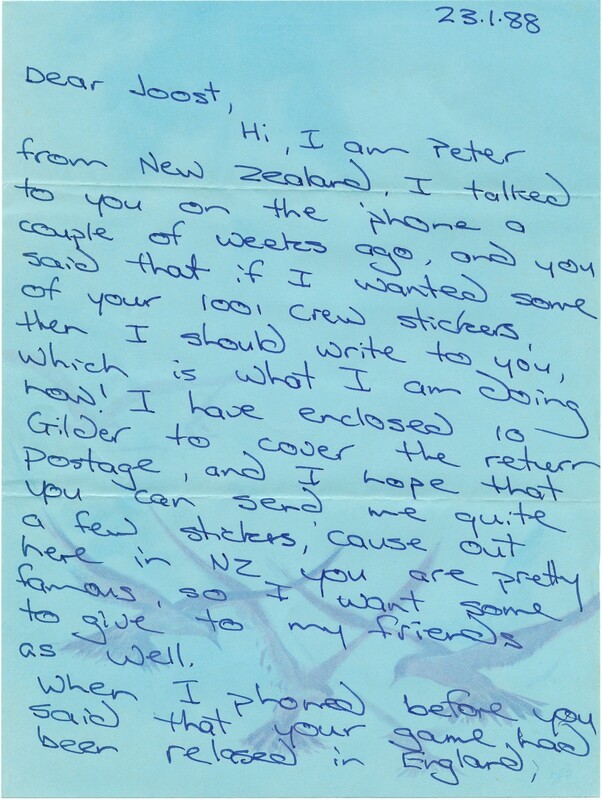 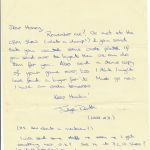 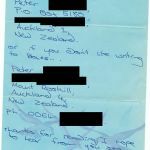 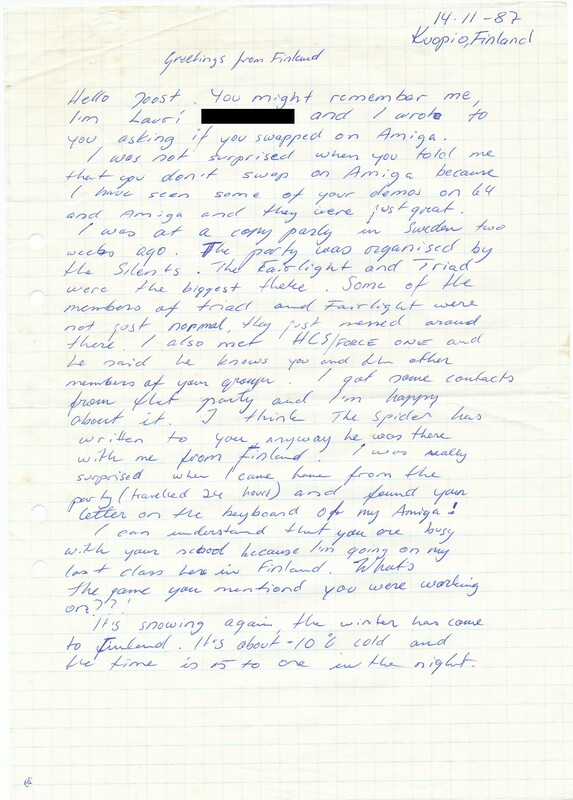 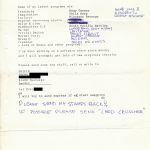 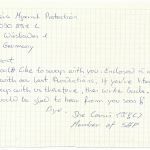 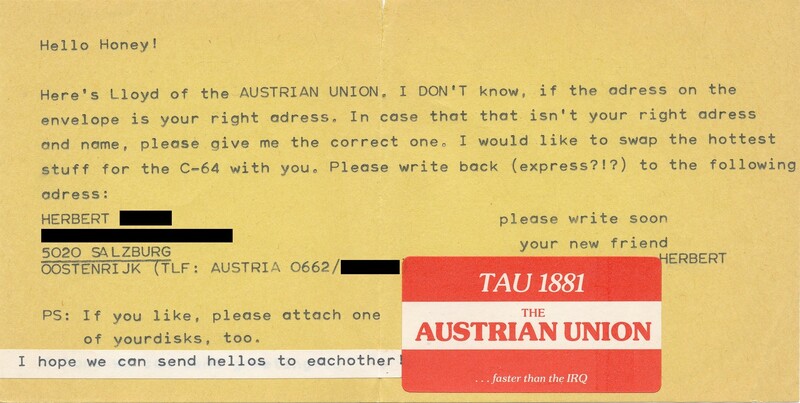 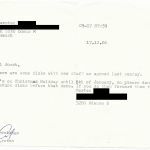 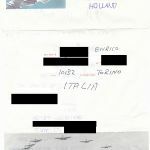 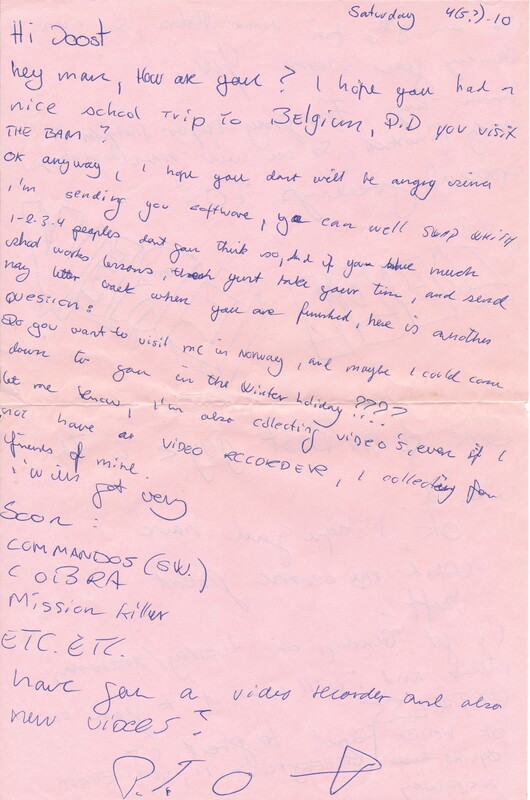 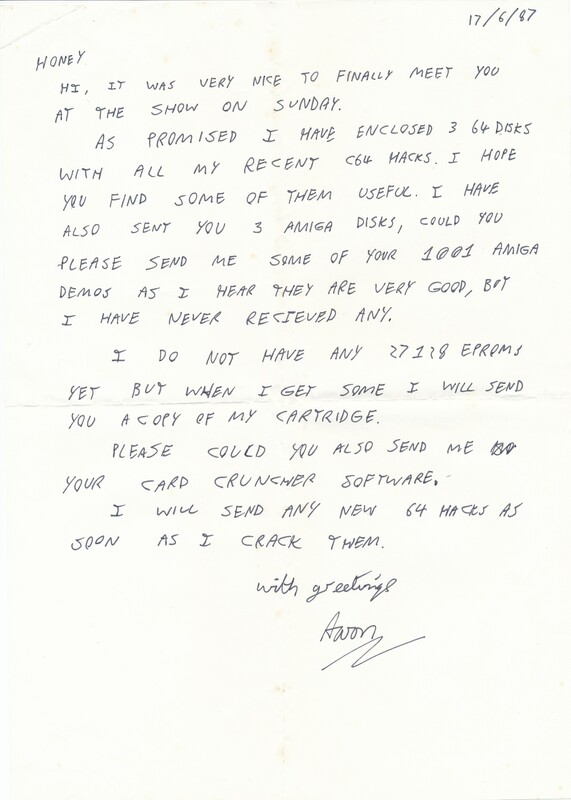 Several 1980s veterans got in touch and promised to scan their old letters, too. 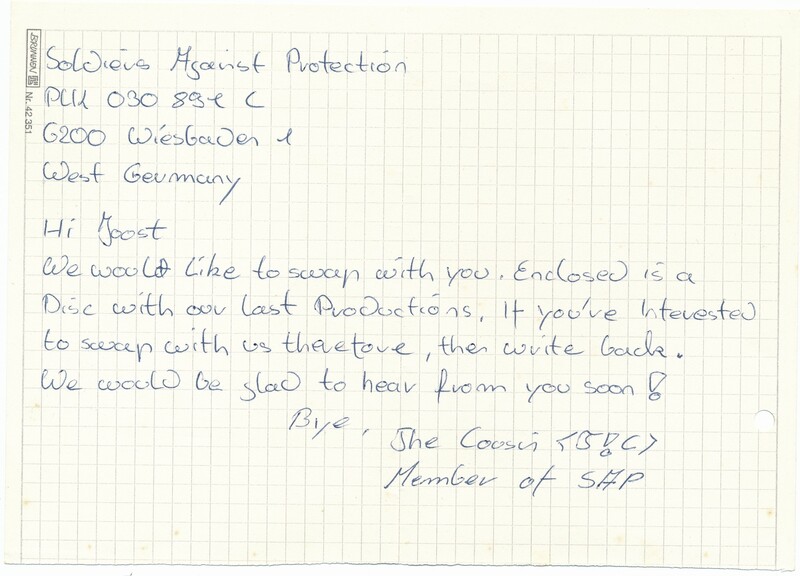 The most amazing contribution so far came from Joost Honig a.k.a. 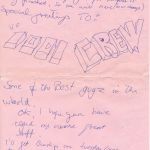 Honey of 1001 Crew, who sent us over 1 GB worth of scans from his personal archive. 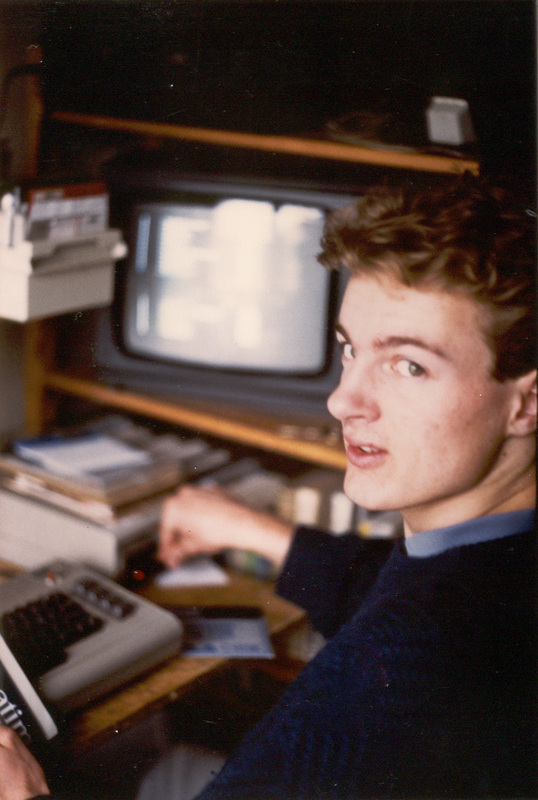 Honey, active on the C64 since 1983, is a scene legend, and 1001 Crew (also known as “1001 & The Cracking Crew”) stood at the very roots of the demoscene. 1001 was not just about cracking games: Together with his groupmates, Honey was responsible for some of the crucial technical breakthroughs in C64 programming, such as sideborder and no-border sprites as early as 1986 – achievements recognised in contemporary commercial computer press as well as in recent literature 1 -, and the famous 1001 Card Cruncher in 1987. 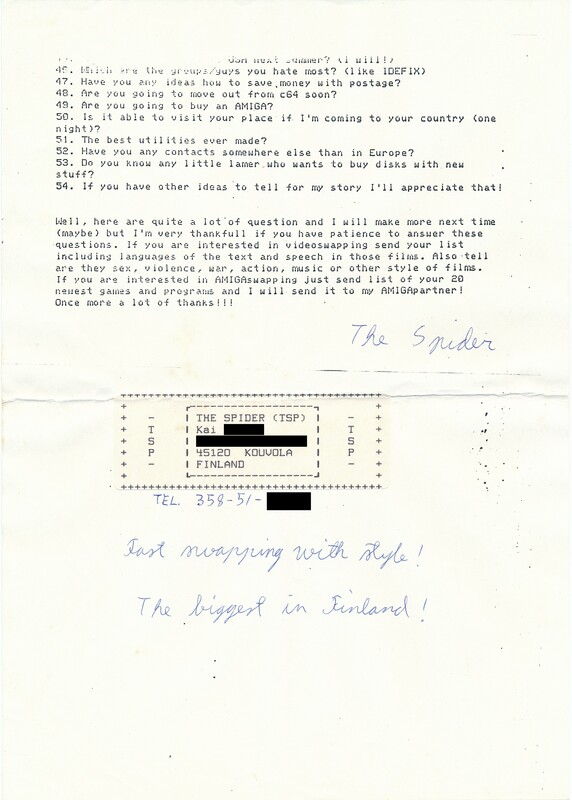 A detailed recent interview with Honey can be found here. 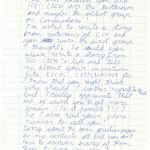 The letters shed light onto a lesser-known realm of 1001 Crew’s activity – namely their transnational communication networks. 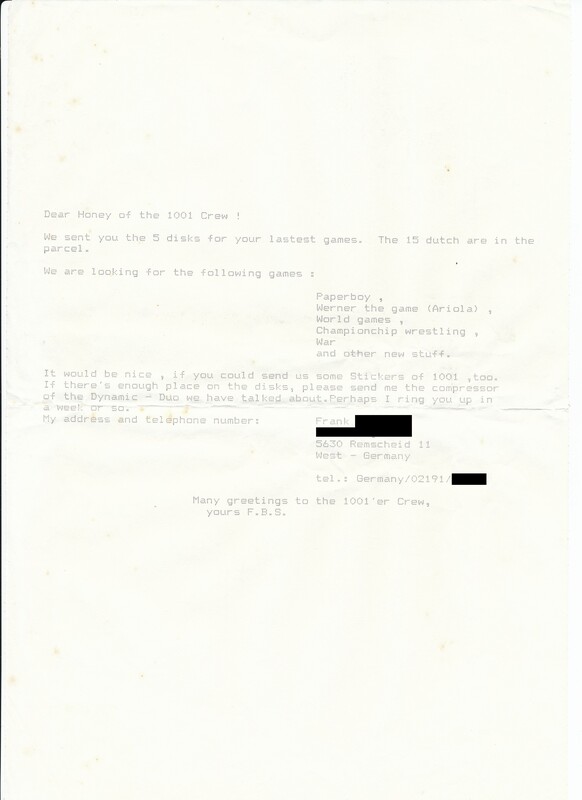 Through their archive, one can slowly see 1001 moving from cracking games to making intros, demos and eventually (ironically) games. 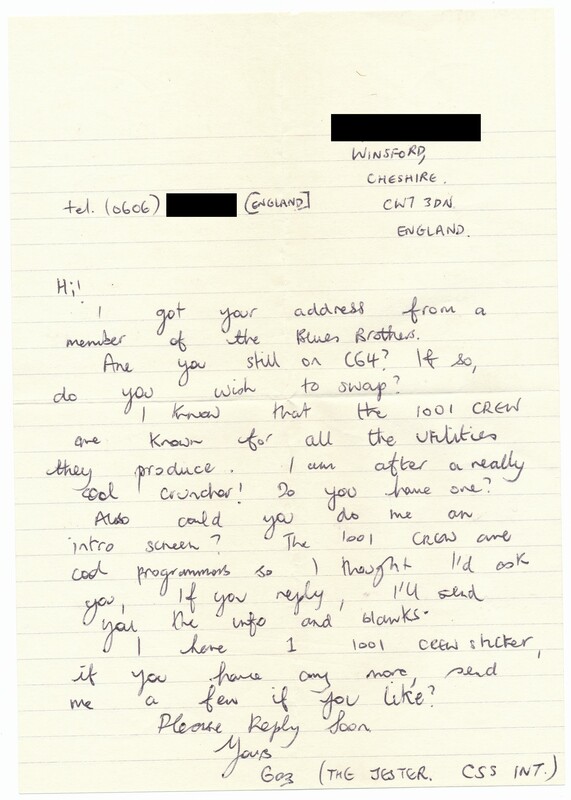 The first batch of letters presented here today stems from the “mixed” folder – letters from random sceners literally from all over the world trying to get in touch with the famous cracker – some with, some without success. 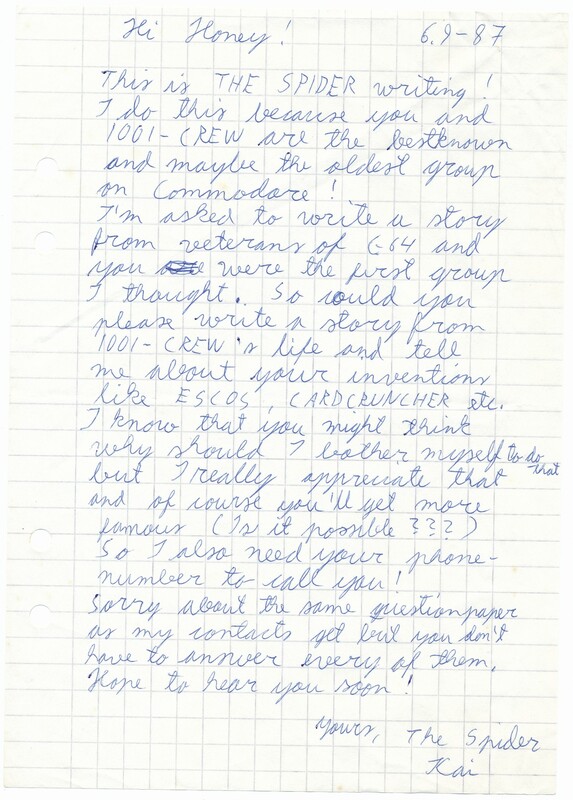 (And those who succeeded establishing contact, couldn’t believe their luck: “Have you got any pictures of you or other members of 1001 crew? 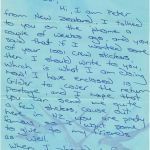 […] My friend whom I told you had answered my letters didn’t believe”, wrote one of Honey’s happy new penpals.) 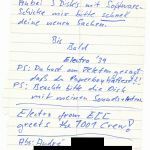 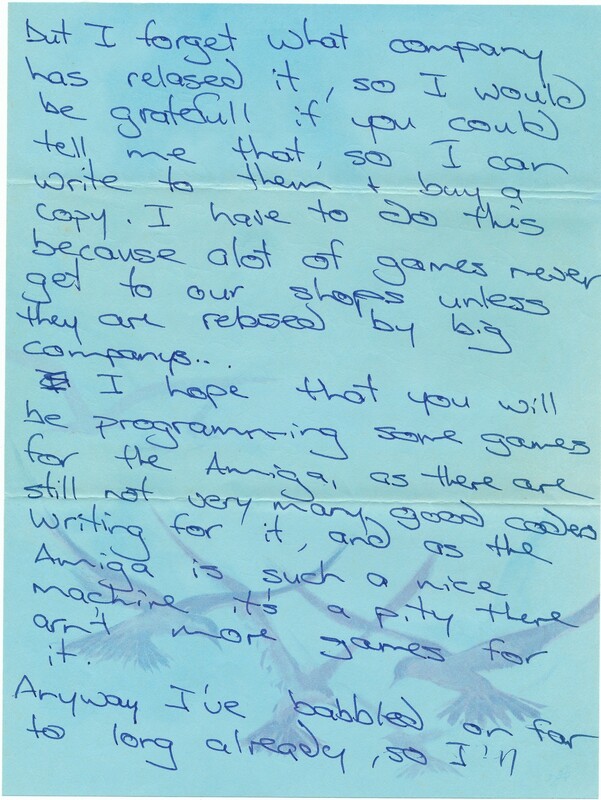 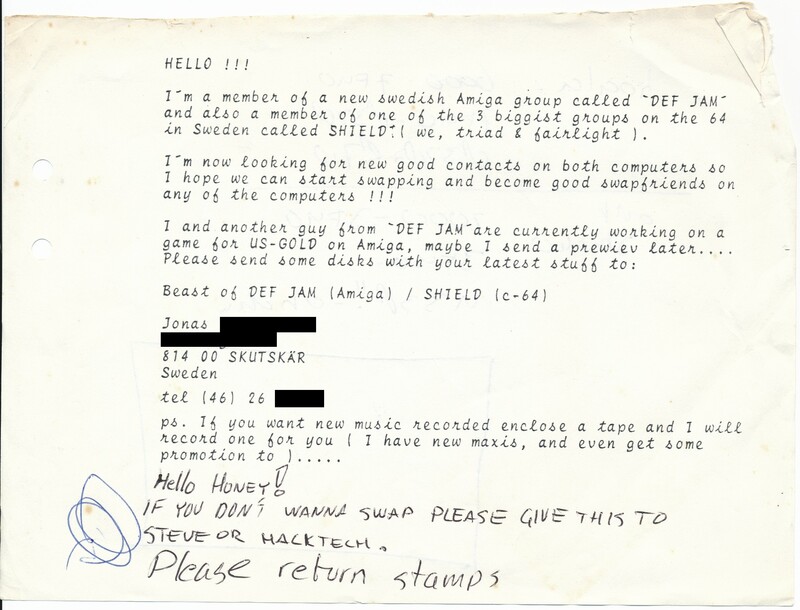 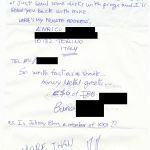 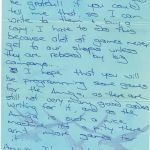 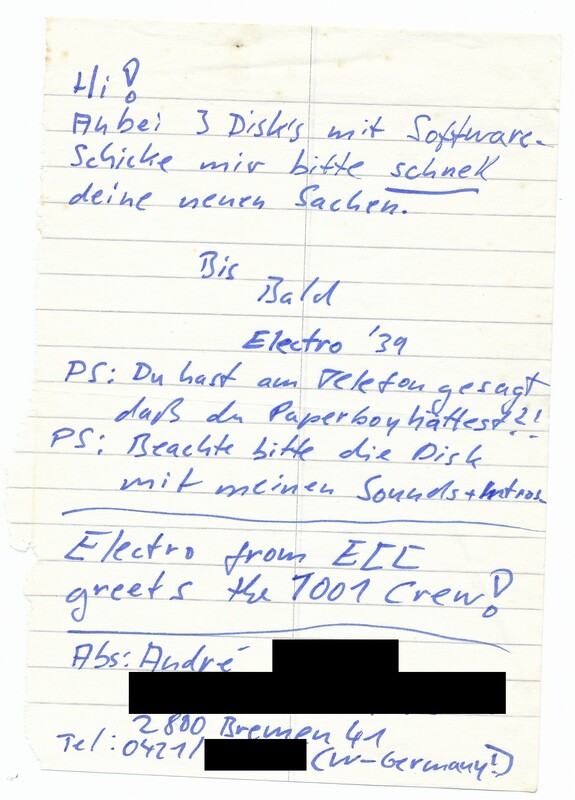 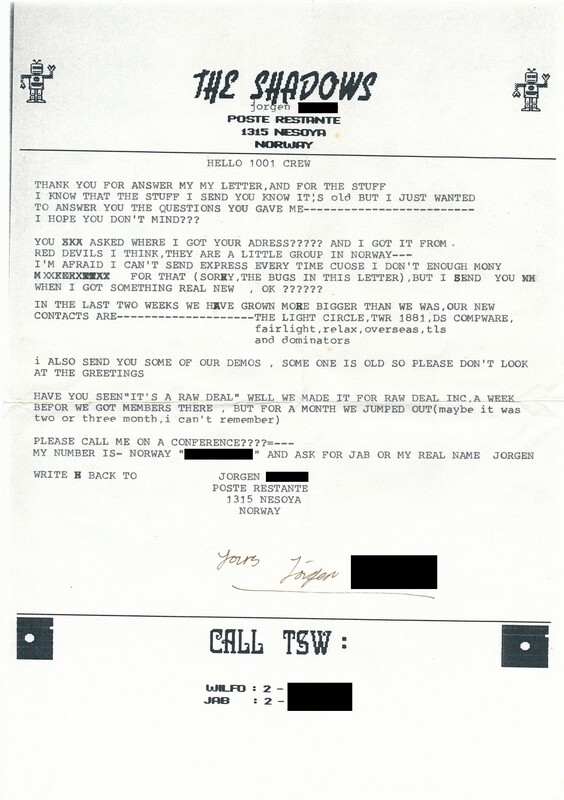 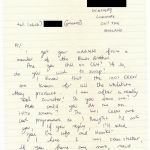 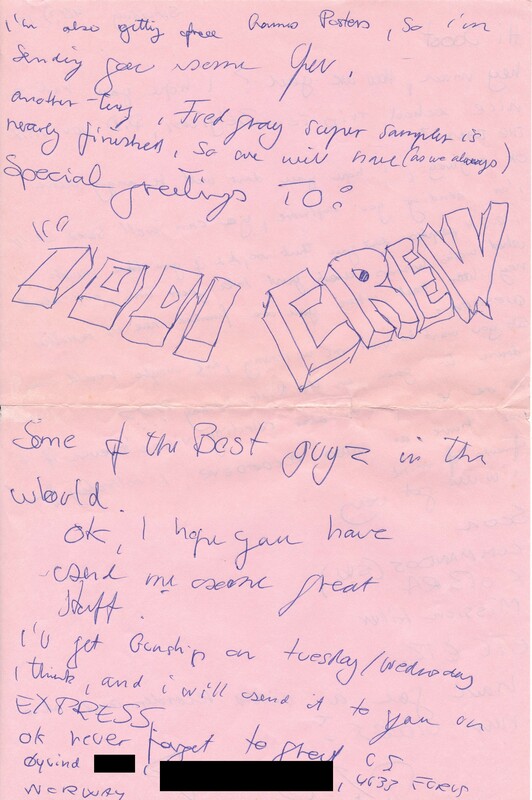 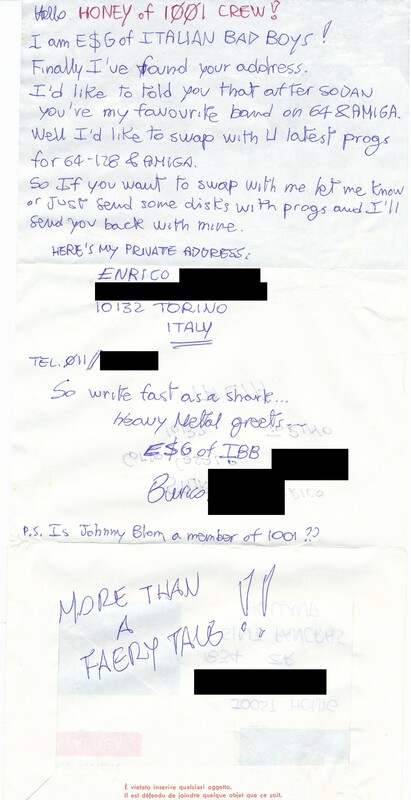 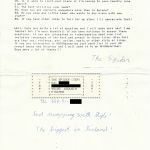 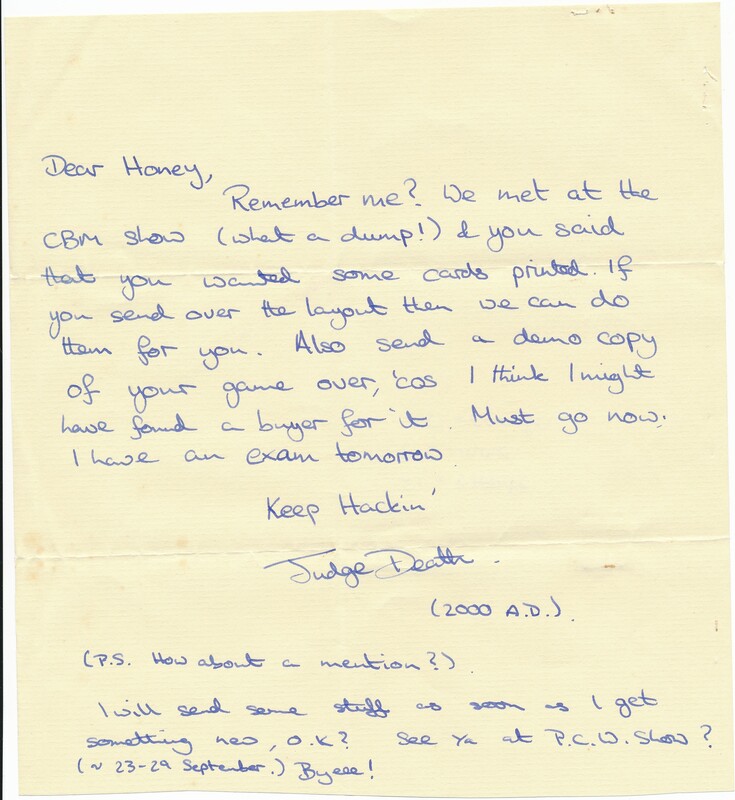 Honey jokingly characterised this genre as “begging letters”, and, indeed, most of the authors were begging the recepient for different favours: fresh games, the group’s latest demos, the famous 1001 Crew stickers, or, more generally, establishing a steady swapping relationship. 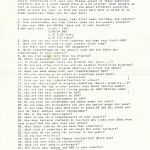 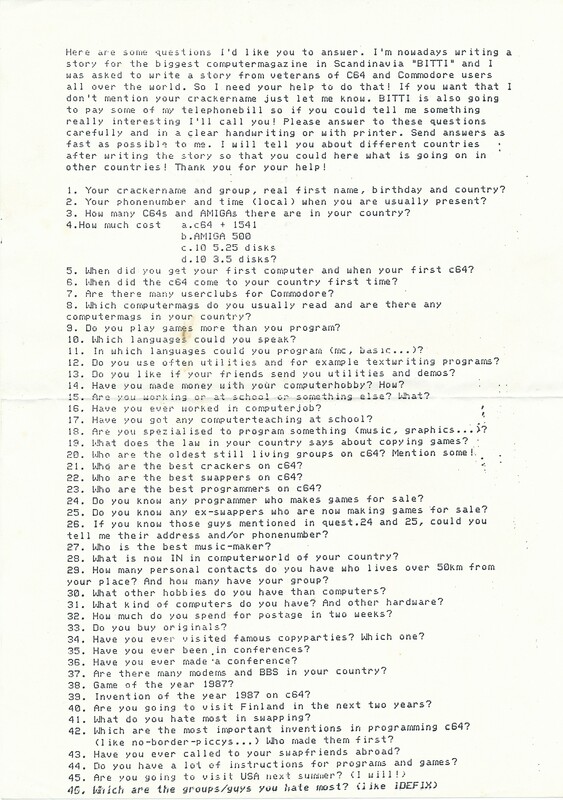 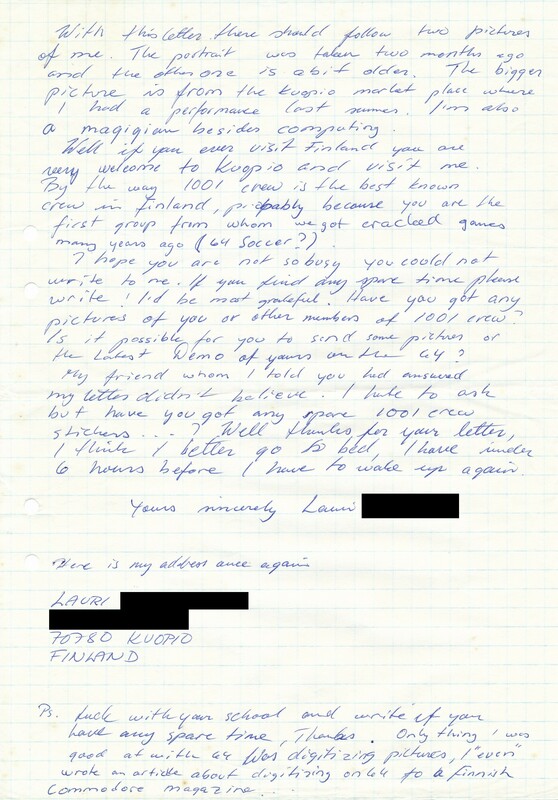 One Finnish scener even sent Honey a long questionnaire (to which he never replied), apparently to use it for an article on the scene commissioned by the Finnish commercial computer magazine BITTI. 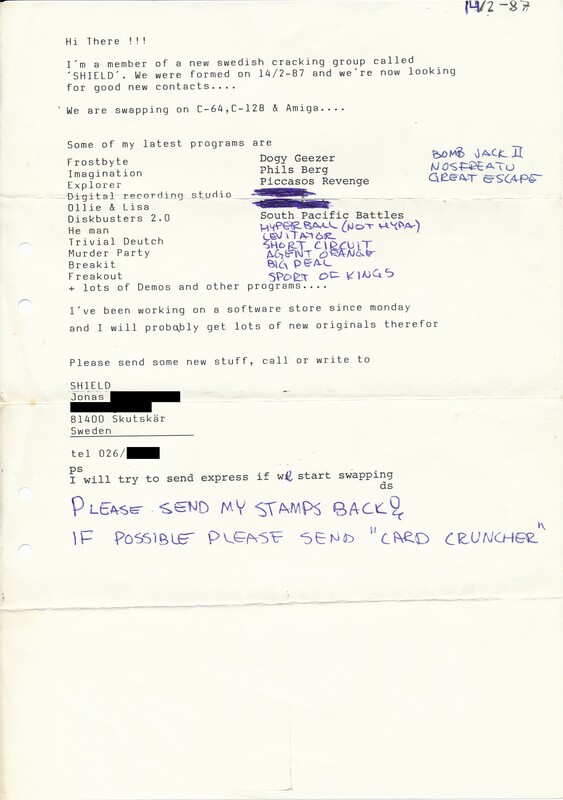 Pingback: Scene-Related Software Manuals | got papers? 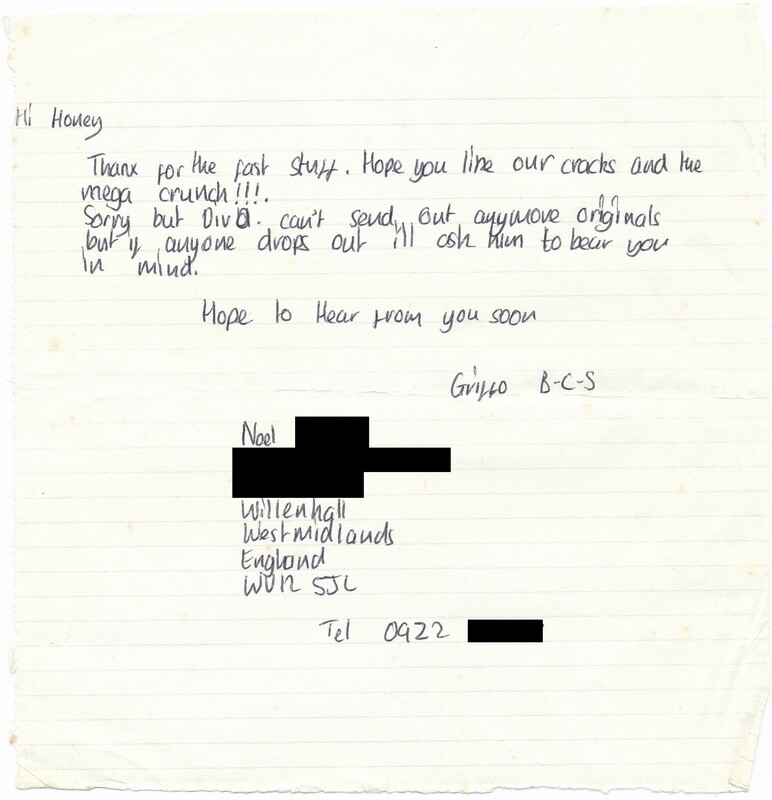 Pingback: Honey/1001 Collection Pt. 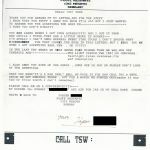 2 | got papers?